Long noncoding RNAs (lncRNAs) represent a large subgroup of RNAs that are longer than 200 nucleotides and have no apparent protein coding potential. They have diverse functions in different biological processes by regulating chromatin remodeling or protein translation. This review summarizes the recent progress of lncRNAs in angiogenesis and vascular diseases. A general overview of lncRNA functional mechanisms will be introduced. A list of lncRNAs, which are termed “Angio-LncRs”, including MALAT1, MANTIS, PUNISHER, MEG3, MIAT, SENCR and GATA6-AS, will be discussed regarding their expression, regulation, function and mechanism of action in angiogenesis. Implications of lncRNAs in vascular diseases, such as atherosclerosis, hypertension, vascular retinopathies and tumor angiogenesis will also be discussed. The vascular system plays critical roles in vertebrate embryonic development and tissue homeostasis in adulthood . Defects in vascular development often lead to embryonic lethality, while aberrant vascular remodeling in adults is associated with numerous vascular diseases. The de novo formation of the initial primitive vascular network occurs via vasculogenesis, the process by which endothelial cells (ECs) differentiate from angioblast precursors. Angiogenesis then drives new blood vessel formation from existing vessels. This begins with EC activation by angiogenic stimuli, including vascular endothelial growth factor (VEGF) or hypoxia. The capillary basement membrane is then degraded, and the ECs start to migrate and proliferate to form primary capillaries. The capillaries will undergo remodeling through sprouting and intussusception, and further differentiate into arteries and veins. During this process, vascular smooth muscle cells (VSMCs) are incorporated, pericytes are recruited, and new extracellular matrix is deposited. In adult tissues, most blood vessels remain quiescent and function to conduct nutritive blood flow. However, postnatal angiogenesis occurs in response to physiological and pathological events, such as reproduction, inflammation, tissue regeneration and tumor growth. Aberrant angiogenesis is associated with the pathogenesis of numerous diseases, including, but not limited to cancer, atherosclerosis, ischemic heart disease, hypertension, and vascular retinopathies. As to the mechanisms of angiogenesis, numerous angiogenic factors and signaling pathways have been show to regulate blood vessel growth and morphogenesis . Recent studies have revealed important functions for noncoding RNAs (ncRNAs) in angiogenesis and vascular disease. NcRNAs can be classified as microRNAs (miRNAs or miRs), circRNA, other small RNAs (including tRNAs, 5S and 5.8S ribosomal RNA, small nuclear RNAs and piRNAs), and long ncRNAs (lncRNAs). In the past decades, significant progress has been made regarding the function and mechanism of miRNAs in angiogenesis and vascular diseases [3, 4]. However, research on lncRNAs in angiogenesis and vascular disease is still in its infancy. The main purpose of this review is to summarize the general functional mechanism of lncRNAs, as well as recent progress regarding their expression, regulation and roles in angiogenesis and vascular disease. For recent reviews about lncRNAs in cardiovascular diseases and therapeutic angiogenesis, please refer to [5, 6]. Numerous transcriptome analyses have revealed that the majority of mammalian genomes are transcribed but do not code for proteins [7-10]. These transcripts can be classified into small (18-200 nucleotides (nt)) and long (>200 nt) noncoding RNAs (lncRNA). Although small regulatory RNA research has dominated the RNA biology field, an increasing number of studies have revealed important biological functions of lncRNAs, suggesting that at least some of lncRNAs are not just transcriptional noise but have biological functions. LncRNAs are defined as long (>200 nt) RNAs with no apparent coding potential. This is true for most lncRNAs, but some lncRNAs encode micropeptides (e.g., myoregulin) . The biogenesis of lncRNAs is similar to mRNAs: they are transcribed by RNA polymerase II, and are then 5'-capped, spliced and polyadenylated . Compared to mRNAs, lncRNAs tend to have fewer but longer exons, relatively lower expression levels and poorer sequence conservation. Based on their genomic localization, lncRNAs can be classified into different categories: (1) sense overlapping lncRNAs that overlap and usually share a promoter with a protein-coding gene, (2) antisense lncRNAs that are located in the antisense orientation of a protein-coding gene, (3) intronic lncRNAs, (4) bidirectional (divergent) lncRNAs that are transcribed from bidirectional promoters and generate mRNAs and lncRNAs in each direction, (5) enhancer lncRNAs that are generated from the enhancer of a protein-coding gene, and (6) intergenic lncRNAs (lincRNAs) that are located between protein-coding genes. LncRNAs are predominantly localized in the nucleus; however, some are also localized, or exclusively found, in the cytoplasm. The mechanism for lncRNA subcellular localization is still elusive. A recent study showed that an Alu element-derived short sequence, which binds to heterogeneous nuclear ribonucleoprotein K (HNRPK or HnRNP-K), could increase lncRNA accumulation in the nucleus . Depending on their subcellular localization, lncRNAs could have very diverse functions, including but not limited to regulating chromatin modification and gene transcription, protein translation and miRNA function. In the nucleus, lncRNAs can act in cis or in trans to regulate chromatin structure and gene expression in close proximity to or distant from their neighboring genes, respectively. Compared to in trans regulatoary mechanism, in cis mechanism could be advantageous for lncRNAs with low-abundance because of the proximity of the lncRNA transcripts or transcription with their target genes. Several modes of lncRNA action in the nucleus are shown in Figure 1. (1) lncRNAs can function as a decoy to regulate the binding of protein to DNA or other proteins (Figure 1A). For example, lncRNA Gas5 contains a hairpin motif that resembles the DNA-binding domain site of the glucocorticoid receptor . Gas5 is induced by starvation to serve as a decoy to release the receptor from the DNA and prevent the transcription of metabolic genes. Metastasis‐associated lung adenocarcinoma transcript 1 (MALAT1) interacts with transcription factor Cyclic AMP response element (CRE)-binding protein (CREB) and regulates its phosphorylation by attenuating the interaction between CREB and Protein Phosphatase PP2A . (2) lncRNAs can function as scaffolds to recruit RNA-binding proteins(RBPs) and tether different proteins together to form large complexes that regulate chromatin structure and gene expression (Figure 1B). Considering a recognizable motif in an oligonucleotide can be 6-8 bases and an average protein is ~2 nm in diameter, a 1000 nt lncRNA can potentially interact with as many as 100 RNA-binding proteins. Additional proteins could be recruited to one lncRNA through direct or indirect mechanisms. For instance, lncRNA HOTAIR can interact with the LSD1/CoREST/REST complex and the Polycomb Repression Complex (PRC)2 through its specific domains of the RNA structure . This in turn ensures gene silencing by coordinating H3K27 methylation and H3K4me2 demethylation. Similarly, spliced-transcript endothelial-enriched lncRNA (STEEL) recruits poly [ADP ribosylase] polymerase 1(PARP-1) to the promoters of endothelial nitric oxide synthase (eNOS) and the transcription factor Kruppel-like factor 2 (KLF2), and upregulates their transcription . (3) LncRNAs can serve as guide RNAs to impart specificity to genomic positions through either RNA-DNA or RNA-protein-DNA interactions (Figure 1C-D). For instance, the Fragile X mental retardation (FMR) 1 gene carries an unstable expansion of CGG repeats in the promoter that can be bound by the FMR1-antisense (AS) lncRNA via RNA-DNA hybrids, which silences FMR1 expression . LncRNA-p21 mediates transcription by physically associating with hnRNP-K and regulating its proper genomic localization . (4) LncRNAs can regulate alternative splicing (Figure 1E). Functional mechanisms of lncRNAs in the nucleus. (A) lncRNAs function as decoys to regulate the binding of proteins to DNA or other proteins, e.g.,GAS5. (B) lncRNAs function as scaffolds to recruit RNA-binding proteins (RBPs) and other proteins to affect gene transcription, e.g., HOTAIR. (C-D) lncRNAs serve as guide RNAs to impart specificity at genomic positions through either RNA-DNA or RNA-protein-DNA interactions, e.g., FMR-AS or LncRNA-p21. (E) lncRNAs regulate alternative splicing by interacting with splicing factors, e.g., MALAT1. (F) lncRNAs from bidirectional promoters or enhancers recruit mediator proteins and/or chromatin remodeling enzymes to influence gene transcription, e.g., HOTTIP. MALAT1 lncRNA interacts with the serine/arginine (SR) splicing factors and alters their phosphorylation status and distribution in the nuclear speckle domains, subsequently regulating alternative splicing . Antisense lncRNA to FGFR2 (FGFR-AS) promotes epithelial-specific alternative splicing of FGFR2. This is achieved by recruiting Polycomb-group proteins and the histone demethylase KDM2a to create a chromatin environment that impairs binding of a chromatin-splicing adaptor complex important for mesenchymal-specific splicing . (5) LncRNAs can be transcribed from bidirectional promoters or enhancers to recruit mediator proteins and/or chromatin remodeling enzymes to influence gene transcription (Figure 1F). HOTAIR and HOXA distal transcript antisense RNA (HOTTIP) are enhancer-associated lncRNAs that regulate the expression of HOX genes [22, 23]. HOTTIP facilitates chromosome looping by recruiting WDR5 and the MLL complex, which maintains active chromatin to coordinate distal HOXA gene expression. 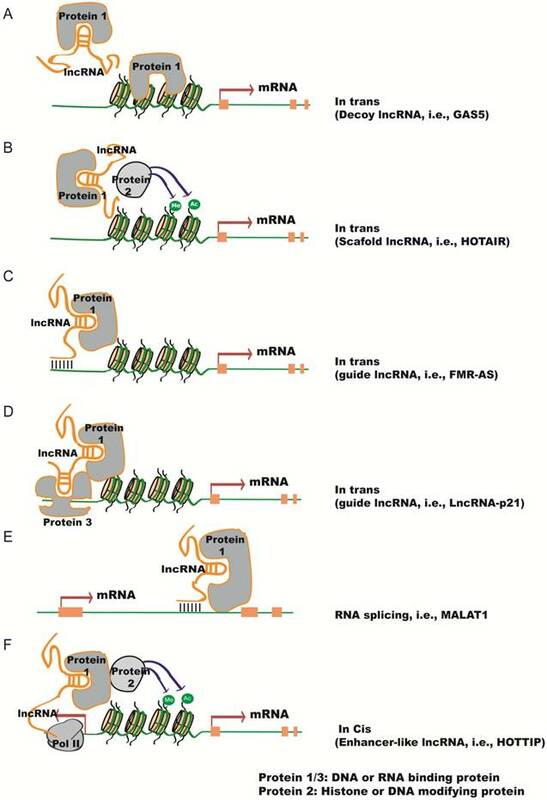 In the cytoplasm, lncRNAs can regulate mRNA stability and translation by a number of different methods  (Figure 2). (1) LncRNAs can interact with proteins that bind to the 3'-untranslated region (UTR) and regulate mRNA stability (Figure 2A). For example, lncRNA 1/2-sbsRNAs is necessary for transactivating staufen 1 (STAU1)-mediated mRNA degradation . STAU1 is a double-stranded RNA-binding protein, which binds within the 3'- UTR of translationally-active target mRNAs. Both STAU1-targeting mRNAs and 1/2-sbsRNAs lncRNA contain an Alu element. The Alu elements in the lnRNA and the STAU1 target 3'-UTR can form imperfect base-pairing and stem structure, which facilitates the binding of STAU1 to its target mRNA and induces mRNA decay. (2) Antisense lncRNAs can regulate the stability of mRNAs by forming duplexes with mRNAs (Figure 2B). For instance, anti-sense lncRNA to beta-secretase-1 (BACE1-AS) can increase BACE1 mRNA stability by masking the binding site for miR-485-5p [26, 27]. (3) Competing endogenous RNAs (ceRNAs) can sequester miRNAs and thereby prevent the repression of their target mRNAs  (Figure 2C). ZEB2, the ceRNA for tumor suppressor PTEN contains binding sites for several miRNAs, has been shown to regulate PTEN expression in a miRNA-dependent manner . T-UCstem1, a lncRNA containing transcribed Ultraconserved elements (T-UCEs), regulates embryonic stem cell (ESC) proliferation by reducing miR-9 levels via T-UCstem1::miR-9 cytoplasmic interactions . Of note, T-UCstem1 plays an additional role in the nucleus through stabilization of the polycomb repressive complex 2 (PRC2), reflecting the flexibility of lncRNA functional mechanisms. (4) LncRNAs can positively or negatively regulate protein translation (Figure 2D). As an example, lncRNA-p21 (also named as lincRNA-p21) represses translation of β-catenin and JUNB mRNAs by imperfect base pairing at different sites in their coding and untranslated regions . LncRNA-p21 levels decline in the presence of RNA-binding protein Hu antigen R (HuR), causing derepression of JunB and β-catenin translation. (5) LncRNAs can affect protein stability through post-translational mechanisms (Figure 2E). HOTAIR acts as a scaffold to recruit E3 ubiquitin ligases, Dzip3 and Mex3b, as well as their respective substrates, Ataxin-1 and Snurportin-1 . As a result, HOTAIR promotes ubiquitination and accelerates the degradation of Ataxin-1 and Snurportin-1. In contrast, Hypoxia-Induced lncRNA-p21 protects HIF-1α from VHL-mediated ubiquitination by disrupting VHL-HIF-1α interactions . 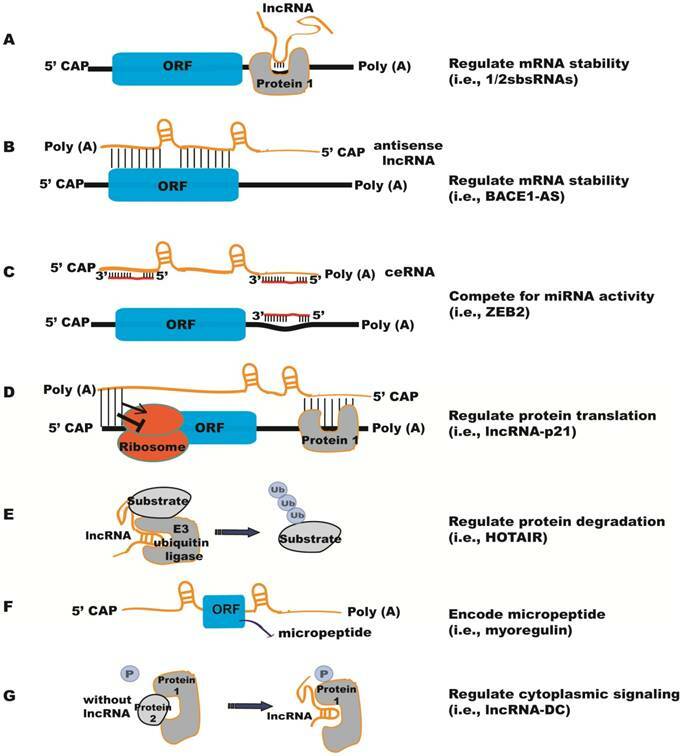 (6) Certain lncRNAs encode micropeptides with regulatory functions (Figure 2F). For example, myoregulin (MLN), a skeletal muscle-specific RNA, encodes an ~5 kDa micropeptide that shows structure similarity to phospholamban and sarcolipin, and functions to regulate muscle performance . However, for some lncRNAs it is unclear whether they have both coding and noncoding functions. (7) LncRNAs can also regulate signaling pathways in the cytoplasm (Figure 2G). Phosphorylation of the STAT3 transcription factor is required for its nuclear transportation and downstream gene activation; a human dendritic cell (DC)-enriched lncRNA (lncRNA-DC) can interact directly with STAT3 in the cytoplasm and block its dephosphorylation by tyrosine phosphatase SHP1 . Compared to mRNAs, lncRNAs generally have much lower abundance but show more cell type-, tissue-, developmental stage- or disease state-specific expression [35, 36]. Recently, a lncRNA microarray identified 116 EC-enriched lncRNAs in human umbilical vein ECs (HUVEC) and human dermal microvascular ECs . Noteble among them include HHIP-AS1, FLI-AS1 (SENCR), LOC100505812/CARD8-AS, aAF161442/HSPC324, and STEEL, which are transcribed antisense to and nonoverlapping with the EC-enriched genes HHIP1, FLI1, CARD8, EGFL7, and HOXD1. RNA deep sequencing has identified 5 lncRNAs that are highly expressed in HUVECs and conserved between mouse and human, which include linc00493, MALAT1, maternally expressed 3 (MEG3), taurine upregulated gene 1 (TUG1), and linc00657 . Among them, MEG3 and MALAT1 expressions are significantly upregulated by hypoxia, a condition that can lead to diverse phenotypes including EC proliferation, migration and angiogenesis, as well as growth arrest and cell death. A systematic study using next-generation sequencing identified ~2000 differentially expressed genes, including 122 lncRNAs in HUVECs treated with hypoxia (1% O2) for 24 or 48 hours . Among the validated lncRNAs, H19, MIR210HG, MEG9, MALAT1 and MIR22HG were also induced in a mouse model of hindlimb ischemia. Furthermore, lncRNAs were identified in hyperglycemia-related endothelial dysfunction associated with diabetic vascular complications. 100 lncRNAs were significantly upregulated and 186 appreciably downregulated after high-glucose exposure for 24 hours by microarray analysis . MALAT1 was not found to be regulated, but reported to be upregulated in choroidal ECs and HUVECs after high glucose exposure by two independent studies [40, 41]. MALAT1 was also found to be upregulated in the aqueous humor and the fibrovasular membrane of diabetic patients . Interestingly, MALAT1 is drastically upregulated by TGF-β, a growth factor that has stimulatory or inhibitory effects on angiogenesis [42, 43]. Functional mechanisms of lncRNAs in the cytoplasm. (A) lncRNAs regulate mRNA stability by interacting with proteins that bind to the 3'-untranslated region (UTR), e.g., 1/2sbsRNAs. (B) Antisense lncRNAs regulate the stability of mRNAs by forming duplexes with mRNAs, e.g., BACE1-AS. (C) Competing endogenous RNAs (ceRNAs) sequester miRNAs and protect their target mRNAs from repression by miRNAs, e.g., ZEB2. (D) lncRNAs can positively or negatively regulate protein translation by imperfect base pairing at different sites in the coding and untranslated regions, e.g., lncRNA-p21. (E) lncRNAs can affect protein degradation through ubiquitin mechanisms, e.g., HOTAIR. (F) lncRNAs encode micropeptides, e.g., myoregulin. (G) lncRNAs prevent proteins from dephosphorylation to regulate cytoplasmic signaling, e.g., lncRNA-DC. These studies suggest that MALAT1 can be induced by multiple stimuli in ECs. Related to oxygen-glucose deprivation (OGD), which can mimic ischemic stroke condition in ECs in vitro, 147 lncRNAs were increased and 70 lncRNAs were decreased by more than 2-fold by OGD in mouse brain microvascular ECs . Among them, the most highly upregulated lncRNAs (Snhg12, MALAT1, and lnc-OGD 1006), as well as the most highly downregulated lncRNAs (281008D09Rik, Peg13, and lnc-OGD 3916), were found to increase or decrease in cerebral microvasculature after in vivo ischemic stimuli, respectively. Yet despite the current studies, expression, cell/tissue distribution and regulation of lncRNAs in angiogenesis are still largely unknown. Due to the non-informative nomenclatures for most lncRNAs, deeper data mining and validation are required from the current studies. Recent studies have revealed the function of individual lncRNAs in vitro and in vivo. Phenotypic characterization of 18 lincRNA knockout strains showed that three of them (Fendrr, Peril and Mdgt) have peri- and postnatal lethal phenotypes, and two other strains (linc_Brn1b and linc-Pint) have growth defects, demonstrating that lncRNAs are critical for mouse survival, as well as lung and brain development in vivo . Here we summarize functional studies of individual lncRNAs in angiogenesis (Figure 3 and Table 1). We use the term “Angio-LncRs” to reference the lncRNAs that regulate or “link” angiogenesis. LINC00323 and MIR503HG were identified by RNA-seq analyses of lncRNAs under hypoxia in HUVECs . LINC00323 isoform 3 (LINC00323-3) and MIR503HG are upregulated by hypoxia specifically in ECs. Silencing of LINC00323-3 in vitro attenuated EC proliferation, migration and capillary tube formation, while overexpression of LINC00323-3 improved EC wound healing in a scratch assay. LINC00323-3 silencing resulted in upregulation of cell cycle inhibitors p21 and p27, and downregulation of ERK phosphorylation, as well as GATA2 and Sirtuin I protein expression. Overexpression of GATA2 partially rescued the phenotypes of LINC00323-3 silencing in ECs. Mechanistically, LINC00323-3 was shown to bind to translation initiation factor eIF4A3, which associates with GATA2 mRNA. Regulation and function of LncRNAs in angiogenesis. MIR503HG is located at chromosome X, harbors a coding sequence of miR-503, and is adjacent to miR-424. Silencing of MIR503HG reduced miR-503 expression, and led to decreased EC proliferation and migration. This is paralleled by a strong upregulation of p21 and repression of GATA2. miR-424, which is adjacent and upstream of MIR503HG, was upregulated by MIR503HG silencing, suggesting a cis-action of MIR503HG on neighboring genes. Similarly, overexpression of miR-424 has been shown to consistently trigger anti-angiogenic effects in ECs . Moreover, silencing of LINC00323-03 or MIR503HG in a 3-D human induced pluripotent stem-cell-derived engineered heart tissue (EHT) model led to reduced EC numbers, suggesting these two lncRNAs are required for proper tissue vascularization ex vivo. MALAT1, also named nuclear-enriched abundant transcript 2 (NEAT2), is a highly conserved nuclear lncRNA initially identified as a predictor for lung cancer metastasis . MALAT1 knockdown markedly reduced cancer tumorigenicity, metastasis, as well as tumor angiogenesis by regulating VEGF and FGF2 expression [49-52]. Silencing of MALAT1 in ECs with siRNA or locked nucleic acid (LNA)-modified GapmeRs promoted cell migration in a 3D spheroid sprouting assay, but blocked EC proliferation, suggesting a switch from proliferation to a pro-migratory state in ECs. The reduced cell proliferation appears to be associated with a reduced number of S-phase cells under basal and hypoxia conditions, and after VEGF stimulation. However, in an independent study, MALAT1 knockdown reduced VEGF or TNF-α-induced migration in retinal ECs in a scratch wound assay, while overexpression of MALAT1 increased retinal EC viability, which was blunted by a P38 MAK pathway inhibitor but not ERK or JNK inhibitors . Moreveor, P38-induced phosphorylation in high glucose-treated ECs was blunted by MALAT1 knockdown. These results indicate the importance of P38 MAPK signaling in mediating MALAT1 function. Additional studies demonstrated that inhibition of MALAT1 repressed EC networking in a Matrigel angiogenesis assay and MALAT1-/- mice showed reduced retinal vascularization, which is associated with reduced retinal EC proliferation. Moreover, inhibition of MALAT1 by intraperitoneal injection of GapmeRs reduced blood flow recovery in an hindlimb ischemia model. Mechanistically, pathways involved in cell cycle and DNA replication are most significantly regulated by MALAT1 knockdown. Specifically, some S-phage cyclins, including endothelial cyclins CCNA2 and CCNB1/CCNB2, were downregulated upon MALAT1 silencing, while some cell cycle inhibitory factors such as protein (Cdc42/Rac)-activated kinase (P21) or the cyclin-dependent kinase inhibitor p27Kip1 were significantly upregulated (Figure 3A) . MALAT1 has been shown to regulate alternative splicing in other cell types , but no evidence of dysregulated splicing was observed in MALAT1 knockdown ECs. The exact functional mechanisms of MALAT1 in ECs have yet to be established. MANTIS, also named as n342419, ANXA4-AS, uc002sft.1 or AK125871, was initially identified as a lncRNA upregulated in HUVECs by silencing of jumonji/ARID domain-containing protein 1B (JARID1B), a specific histone demethylase shown to maintain normal endothelial gene expression . It is an intronic antisense lncRNA to Annexin A4 (ANXA4). MANTIS does not appear to code for any micropeptides and is predominantly located in the nucleus of cells, including ECs. MANTIS expression is downregulated, whereas JARID1B is upregulated, in lungs from patients with end-stage idiopathic pulmonary arterial hypertension (IPAH), an isolated small-vessel disease accompanied by endothelial dysfunction, endothelial apoptosis and proliferation. Conversely, MANTIS is induced, while JARID1B is downregulated, by laminar flow in endothelium of glioblastoma, and during vascular regeneration in the atherosclerosis regression phase in monkeys. CRIPSR/Cas9-mediated knockout or siRNA knockdown of MANTIS in HUVECs greatly repressed angiogenesis in Matrigel assays in vivo and in vitro, as well as in spheroid sprouting assays. Electrospray ionization mass spectrometry of samples from MANTIS RNA pulldown experiments identified the Brahma related gene-1 (BRG1) as a specific MANTIS-interacting protein. BRG1 expression is increased in humans with thoracic aortic aneurisms and is a known regulator of EC and vascular smooth muscle cell (VSMC) function [55, 56]. Loss of MANTIS expression also led to the downregulation of many angiogenesis-related mRNAs, including SOX18, SMAD6 and COUP-TFII, and upregulation of stress-induced genes like IL6 and SOD2 (Figure 3B). The neighboring genes in the MANTIS locus, including ANXA4, were not affected, excluding a cis-regulatory activity of MANTIS in HUVECs. Interestingly, SOX18, SMAD6 and COUP-TFII were also downregulated in IPAH patients, but increased in ECs isolated from glioblastoma, signifying a potential disease connection via MANTIS regulation. Downregulation of either of SMAD6, COUP-TFII or SOX18 attenuated endothelial sprouting in the spheroid outgrowth assay. However, overexpression of SMAD6, COUP-TFII or SOX18 failed to rescue endothelial sprouting phenotype by MANTIS knockdown, raising the possibility that multiple factors may act in concert to mediate MANTIS function. Functional mechanisms of several important Angio-LncRs in angiogenesis. (A) MALAT1 regulates CCNA2, CCNB1/B2, p21 and p27Kip1 expression, and angiogenesis through unknown mechanisms. (B) MANTIS facilitates the interaction between BAF155 and BRG1 to promote angiogenesis by regulating the expression of SOX18, SMAD6 and COUP-TFII. (C) MEG3 represses angiogenesis by acting as a miR-9 sponge RNA, or by interacting with p53 to repress VEGF transcription. (D) MIAT interacts with miR-150-5p, which can target VEGF, to promote angiogenesis. (E) NRON inhibits angiogenesis by repressing the de-phosphorylation of NFAT and blocking its nuclear translocation. (F) SENCR promotes angiogenesis by regulating CX1CL3,CCL5 and CEACAM1 expression through undefined mechanisms. (G) Tie1-AS pairs with Tie1 mRNA to disrupt its function in promoting angiogenesis. (H) GATA6-AS promotes angiogenesis by negatively regulating LOXL2, which represses H3K4me3 methylation. (I) STEEL interacts with PARP1 to promote angiogenesis by regulating the expression of eNOS and KLF2. eNOS and KLF2 in turn negatively regulate STEEL expression. To dissect the mechanism of MANTIS function, Assay for Transposase Accessibility with subsequent DNA Sequencing (ATAC-Seq) was performed after MANTIS knockdown. Less open chromatin at the transcriptional start sites (TSS) of SMAD6, SOX18 and COUP-TFII was observed after loss of MANTIS, which was also confirmed by Formaldehyde Assisted Isolation of Regulatory Elements (FAIRE) analysis. This is consistent with the increased binding of the H3K27me3, and decreased binding of BRG1 and RNA Polymerase II near the TSS of SMAD6, SOX18 and COUP-TFII. BRG1 functions as an ATP-dependent helicase in the SWI/SNF chromatin remodeling complex and its remodeling activity is stimulated by the protein BAF155 . To understand the function of MANTIS with the SWI/SNF complex, the interaction of BRG1 with its interaction partners BAF155 and BAF53A was studied by proximity ligation assays. The binding of BRG1 to BAF155 was significantly reduced by MANTIS depletion and increased by MANTIS or MANTIS Alu element overexpression. Moreover, BRG1 ATPase activity was drastically decreased by MANTIS knockdown, indicating that MANTIS improves the ATPase activity of BRG1 by stabilizing its interaction with BAF155. In cardiomyocytes, lncRNA Myheart (Mhrt) interacts with the helicase domain of BRG1 and represses chromatin target recognition of BRG1, suggesting the mechanism of SWI/SNF complex assembly may be cell-type specific . Overall, these studies indicate that MANTIS is a trans-acting lncRNA that functions as a scaffold to regulate activity of the chromatin remodeling factor BRG1 to facilitate angiogenic gene expression . Maternally expressed gene 3 (MEG3) is an imprinted lncRNA gene located on mouse distal chromosome 12 and on human chromosome 14q . MEG3 is expressed in many normal tissues, and loss of MEG3 expression has been observed in many primary human tumors and tumor cell lines. MEG3 has anti-proliferative and pro-apoptotic activities, and therefore has tumor suppressor function, partly through stimulating P53 accumulation [61, 62]. In HUVECs, MEG3 overexpression inhibited, while MEG3 knockdown promoted, cell proliferation, survival, and EC networking [63, 64]. However, in an independent study, knockdown of MEG3 significantly repressed VEGF-induced EC migration and angiogenic sprouting by interfering with VEGFR2 expression, suggesting a positive role for MEG3 in angiogenesis . In mice, maternal deletion of the Meg3 gene results in skeletal muscle defects and perinatal death , while Meg3 knockout embryos exhibit an upregualtion of genes involved in angiogenic pathways, including Vegfa, Vegfr1, Iqgap1, and Wasl in the VEGF pathway, and Hes1 and Dll4 in the Notch pathway . These expression profiles are consistent with increased cortical microvascular density in Meg3 knockout embryos. Incidentally, the negative association between MEG3 and VEGF expression was also observed in the cartilage cells from osteoarthritis patients . Mechanistically, MEG3 may regulate angiogenesis through several mechanisms (Figure 3C). For instance, p53 can negatively regulate VEGFA transcription through binding to its promoter , and MEG3 has been shown to interact with p53 and stimulate p53-mediated transcription . Alternatively, RNA pulldown assays showed that MEG3 can interact with endogenous miR-9, indicating MEG3 may also function as a ceRNA by serving as a miR-9 sponge. Overexpression of miR-9 decreased MEG3 expression levels, and MEG3 overexpression decreased miR-9 levels in HUVECs. Moreover, miR-9 transfection partially abolished MEG3-induced suppression of EC growth and capillary-like structure formation, suggesting the interaction between MEG3 and miR-9 is important in EC growth and angiogenesis . MIAT was initially discovered as a myocardial infarction (MI)-associated transcript (MIAT) and a single nucleotide polymorphism in the MIAT gene is associated with MI pathogenesis . MIAT is expressed in cardiac cells and in the nucleus of several retinal cells. It is induced by high glucose, and upregulated in the retina of diabetic rats and the fibrovascular membrane of the diabetic patients . Knockdown of MIAT in ECs decreased cell proliferation and increased cell death under high glucose conditions, as well as repressed EC migration and primitive vascular network formation induced by TNF-α or VEGF. MIAT acts as a miR-150-5p sponge (Figure 3D): injection of miR-150-5p mimic reduced MIAT RNA level in diabetic and non-diabetic retinas, while miR-150-5p antagomiR upregulated MIAT levels. By functioning as a sponge for miR-150-5p, MIAT relieved miR-150-5p-associated repression of VEGF. On the other hand, overexpression of miR-150-5p reduced retinal EC proliferation and viability, which was partially prevented by MIAT overexpression or exogenous VEGF addition. These studies established MIAT as an endogenous miR-150-5p sponge to regulate angiogenesis [71, 72], and are therapeutically relevant because endothelial miR-150 has been shown to be an intrinsic suppressor of pathological ocular neovascularization . VEGF-inducible Nuclear factor of activated T-cells (NFAT) has been shown to regulate angiogenesis [74, 75]. Noncoding repressor of NFAT (NRON) was initially identified as a critical repressor of NFAT dephosphorylation where it inhibits NFAT nuclear trafficking by acting as a NFAT decoy (Figure 3E) [76, 77]. NRON overexpression inhibits NFAT expression and reduces EC proliferation, migration and networking, while its silencing has the opposite effect . In regards to cardiovascular physiology, NRON is upregulated in the plasma of heart failure patients, and is negatively correlated with HDL levels but positively correlated with LDL levels . PUNISHER was initially identified by RNA sequencing of cardiovascular lineage cells differentiated from human pluripotent stem cells . Three lncRNAs were researched in the study: TERMINATOR was shown to be differentially expressed in the nucleus of pluripotent stem cells, whereas ALIEN and PUNISHER were found to be expressed in both the nucleus and cytoplasm of the cardiovascular progenitors and ECs, respectively. PUNISHER is an antisense lncRNA covering exonic and intronic sequences of the AGAP2 gene, and its genomic location is conserved in mice and humans. PUNISHER showed an EC-specific expression pattern during zebrafish and mouse embryonic development, with highest expression observed at mouse embryonic day 12.5 and in zebrafish at 72 hours after fertilization. Inhibition of ALIEN in Zebrafish by morpholino led to defective vascular patterning and cardiac chamber formation, demonstrating that ALIEN functions in the early developmental progenitor stage common to the vascular and cardiac lineage. Inhibition of PUNISHER also resulted in severe vascular defects, including defective branching and compromised vessel formation, a phenotype rescued by co-injection of its human homolog. Inhibition of PUNISHER in HUVEC cells resulted in decreased histone H3 phosphorylation, decreased mitosis, and impaired capillary-like structure formation in Matrigel. These results correlate with the downregulation of genes involved in mitosis and cell division, while genes involved in cell adhesion and extracellular interactions were demonstrated to be upregulated in the absence of PUNISHER. PUNISHER knockdown also impaired acetyl-low-density lipoprotein uptake, indicating the requirement of PUNISHER in maintaining EC functionality. However, the direct functional mechanisms of PUNISHER in ECs is still unknown. SENCR was named after a smooth muscle and endothelial cell-enriched migration/differentiation-associated long noncoding RNA . It is located in an antisense orientation within an intron of the protein-coding gene Friend leukemia virus integration 1 (FLI1) in mouse and human. SENCR has two isoforms. It is expressed in both the nucleus and cytoplasm in HUVECs and ECs differentiated from human embryonic stem cells (hESCs) . SENCR expression is upregulated during directed EC differentiation from human embryonic stem cells (hESCs), which correlates with FLI1 expression. SENCR overexpression does not impact hESC pluripotency, but did stimulate the generation of hESC-EC expressing cells and increased EC gene expression, suggesting a role for SENCR in controlling the EC commitment from hESC. Silencing and overexpression of SENCR in ECs by lentivirus reduced and stimulated EC migration and capillary-like structures on matrigel, respectively, indicating a positive role for SENCR in angiogenesis. Likewise, the angiogenic promoting factors CCL5 and CX3CL1 were confirmed to be downregulated by SENCR silencing and upregulated by SENCR overexpression in microarray analyses (Figure 3F). CCL5 is a chemokine shown to induce angiogenesis through its receptors CCR1, CCR5, syndecan-1, syndecan-4 and CD-44 . CX3CL1 can activate angiogenesis through its receptor CX3CR1 by upregulatiing HIF-1α and VEGF-A expression and promoting VEGF signaling pathway . Although studies link SENCR to the regulation of CCL5 and CX3CL1, the exact mechanisms of SENCR action are still unknown. In addition, SENCR expression is altered in different tissues affected by various cardiovascular diseases. Human critical limb ischemia (CLI) is an occlusive peripheral arterial disease resulting in inadequate perfusion of the limb and EC dysfunction has been associated with the premature onset of coronary artery diseases (CAD). SENCR expression was reduced in the limb muscle sample of CLI and vessel wall ECs from premature CAD compared to the controls, suggesting that SENCR dysregulation is associated with EC dysfunction and atherosclerotic vascular disease. Tie-1AS lncRNA was the first lncRNA shown to be important for vessel growth . Tyrosine kinase containing immunoglobulin and epidermal growth factor homology domain-1 (tie-1) is a cell-surface tyrosine kinase receptor for angiopoietin ligands that play a role in vascular development in vertebrates . Tie-1 AS was identified as an evolutionarily conserved Tie-1 antisense lncRNA. Tie-1AS is expressed in the axial vessels, dorsal aorta, and posterior cardinal vein during zebrafish development, which temporally and spatially localizes with its native target Tie-1. Additionally, Tie-1AS is also expressed in the ear and brain. Bioinformatic predictions and RNA protection assays confirmed that tie-1AS indeed binds specifically to tie-1 mRNA (Figure 3F). Injection of tie-1AS RNA in zebrafish reduced tie-1 mRNA expression and phenocopied Tie-1 morphants, which showed specific defects in EC contact junctions. In humans, there are three Tie-1AS isoforms. Overexpression of human tie-1AS isoform-2 disrupted EC tube formation in collagen gels in response to VEGF. This study intimates that antisense lncRNAs can regulate endothelial function by binding to the sense mRNAs and interfering with their function. Long non-coding antisense transcript of GATA6 (GATA6-AS) was initially identified as a lncRNA upregulated by hypoxia in HUVECs using RNA deep sequencing . GATA6-AS is predominantly localized in the nucleus of ECs under normal and hypoxia conditions. Silencing of GATA6-AS in ECs prevented endothelial-mesenchymal transition and suppressed angiogenic sprouting in spheroid assays. EC migration but not proliferation or apoptosis was reduced by GATA6-AS silencing. However, when GATA6-AS-silenced HUVECs were transplanted in inmmune-deficient mice in vivo, more perfused vessels were formed. Mechanistically, GATA6-AS does not affect GATA6 expression, ruling out a cis-regulatory mechanism. Instead, it epigenetically regulates endothelial gene expression by acting as negative regulator of nuclear function of lysyl oxidase-like 2 (LOXL2) (Figure 3G). Nuclear LOXL2 acts as a transcriptional co-repressor by deaminating trimethylated lysine 4 of histone H3 (H3K4me3), a chromatin signature for transcriptional activation. LOXL2 silencing in ECs led to reduced angiogenic sprouting, in contrast to the in vivo GATA6-AS loss-of-function phenotypes. LOXL2 was idenfified as a GATA6-AS interaction protein by RNA pulldown. Silencing of GATA6-AS significantly reduced H3K4me3 levels, whereas silencing of LOXL2 augmented H3K4me3 marks. A set of genes, including periostin and cyclooxygenase-2 (Cox-2), were consistently and inversely regulated by GATA6-AS and LOXL2 silencing. Although further clarification is needed, this study suggests a repressive role for GATA6 in angiogenesis by negatively regulating the epigenetic function of LOXL2. STEEL was initially identified as a human EC-enriched lncRNA . It was also peviously known as HOXD-AS1 or HAGLR. It is transcribed in the antisense direction and positioned in the intergenic region between the HOXD1 and HOXD3 loci. Gain-of-function and loss-of-function experiments in vitro suggested that STEEL promotes new blood vessel formation by enhancing cellular turnover, migration, and network formation. Moreover, STEEL-overexpressing HUVEC cells exhibited greater density of perfused vessels in vivo. Mechanistically, STEEL up-regulates the expression of both endothelial nitric oxide synthase (eNOS) and Kruppel-like factor 2(KLF2) by regulating their promoter accessibility via interaction of chromatin-associated STEEL with Poly [ADP-ribsome] polymerase 1 (PARP1) (Figure 3H). Through a feedback inhibition mechanism, STEEL is negatively regulated by KLF2 and eNOS in the presence or absence of laminar flow, suggesting tight regulation of STEEL-induced phenotypes. Interestingly, decreased expression of STEEL was observed in ECs under “atheroprotective” flow compared with disturbed “atheroprone” flow, suggesting the involvement of STEEL in atherosclerosis. This work identifies a role for STEEL in regulating the phenotypic adaptation of ECs to hemodynamic forces by regulating the transcription of key mediators of blood flow. Vascular pathologies, including pathological angiogenesis, are associated with numerous diseases, such as atherosclerosis, CAD, hypotension, vascular retinopathies, and tumorigenesis. Recent studies have revealed important implications for lncRNAs in vascular disorders. LncRNAs have evolved as promising biomarkers and therapeutic targets for various vascular diseases. Here we will summarize the role of lncRNAs in the vascular complications of several relevant diseases (Figure 4 and Table 2). Atherosclerosis is the leading cause of morbidity and mortality in the developed countries. Atherogenesis begins with endothelial dysfunction and infiltration of leukocytes into the endothelium, followed by the formation of fatty streaks, which progress into intermediate and advanced lesions and vulnerable plaques . The plaque buildup limits the flow of oxygen-rich blood to organs and can cause heart attack or stroke. Chronic inflammation, VSMC phenotypic switch and neovascularization are important processes involved in atherosclerotic lesion development and plaque rupture. Recent studies have shown the involvement of lncRNAs in different processes implicated in atherosclerosis . EC dysfunction by oxidized low-density lipoprotein (ox-LDL) and the subsequent EC activation play an important role in atherogenesis. The expression of ~1900 lncRNAs was altered upon ox-LDL exposure in ECs, with CLDN10-AS1 and CTC-459I6.1 being the most regulated . In a human model of EC activation induced by peripheral venous congestion, 27 lncRNAs were upregulated and 1 was downregulated . Several individual lncRNAs have been studied for atherosclerosis-related function. Transforming growth factor beta 2 overlapping trscript 1 (TGFβ2-OT1) is a lncRNA derived from the 3'UTR of TGFβ2. Its expression is regulated by lipopolysaccharide and ox-LDL . TGFβ-OT1 acts as an endogenous competing RNA when bound to miRNAs. Overexpression of TGFβ-OT1 leads to repression of three miRNAs (miR-3960, miR-4488 and miR-4459) . Overexpression of these miRNAs led to repression of their downstream targets, including CERS1 (ceramide synthase 1), NAT8L (N-acetyltransferase 8-like), and LARP1 (La ribonucleoprotein domain family, member 1), which are involved in central processes in endothelial injury, such as EC autophagy and inflammation (Figure 4A) . Palmitic acid (PA) can impose damage to ECs, which is rescued by clopidogrel, an antiplatelet agent widely used for treating cardiovascular disease . LncRNA HIF1α-AS1 was identified as a major lncRNA downregulated by clopidogrel treatment in ECs. Moreover, silencing of HIF1α-AS1 significantly reduced PA-induced EC apoptosis and promoted EC proliferation. HIF1α-AS1 was found to be overexpressed in thoracoabdominal aorta aneurysm patients, and similar HIF1α-AS1 function was also observed in VSMCs [96, 97]. These studies suggest a causative role for HIF1α -AS1 in atherosclerosis. Another lncRNA, retinal non-coding RNA3 (RNCR3), was upregulated in cultured ECs and VSMCs upon Ox-LDL treatment, and also in mouse and human aortic atherosclerotic lesions . RNCR3 knockdown reduced proliferation, migration, and accelerated apoptosis of EC and VSMC in vitro, and aggravated the development of atherosclerosis, hypercholesterolemia and the release of inflammatory factors in vivo. RNCR3 imparts its function as an athero-protective ceRNA by acting as a miR-185-5p sponge and competing with KLF2 for binding to miR-185-5p (Figure 4B); KLF2 is considered an athero-protective gene . These studies suggest a protective role for RNCR3 in atherosclerosis. During atherogenesis, circulating monocytes migrate into the intima. After differentiation into macrophages, they begin to take up Ox-LDL and transform into foam cells. Altered lncRNA expression has been reported in THP-1 macrophage-derived foam cells by Ox-LDL treatment . One of the upregulated lncRNAs, lincRNA-DYNLRB2-2, was shown to promote ATP-binding cassette transporter A1 (ABCA1)-mediated cholesterol efflux from THP-1 macrophage-derived foam cells, and inhibit the inflammatory response (Figure 4C) . LncRNA HOXC cluster antisense RNA 1 (HOXC-AS1) and its nearby gene HOXC6 were downregulated by Ox-LDL in THP-1 cells, and reduced in renal arterial intima tissues and advanced atherosclerotic plaques in patients . Lentivirus-mediated overexpression of HOXC-AS1 induced HOXC6 expression, and suppressed the induction of cholesterol accumulation by Ox-LDL, suggesting a protective role for HOXC-AS1 in atherosclerosis (Figure 4D). Another lncRNA, RP5-833A20.1, represses reverse cholesterol transport by inducing miR-382-5p and decreasing nuclear factor IA (NFIA) expression (Figure 4E) . Therefore, these three lncRNAs might regulate atherosclerotic plaque formation by regulating cholesterol accumulation in foam cells. Functional mechanisms of lncRNAs in vascular disease. (A) Induced by LPS and OxLDL, TGFβ2-OT1 regulates atherosclerosis through microRNAs-mediated EC autophagy and inflammation. (B) RNCR3 is induced by OxDLD, and is athero-protective by serving as a miR-185-5p sponge, which in turn represses KLF2. (C) Induced by OxLDL, lincRNA-DYNLRB-2 regulates atherosclerosis by boosting the GPR119/GLP-1R pathway. (D ) lncRNA HOXC-AS1 represses cholesterol accumulation through the stimulation of HOXC6 expression. (E) lncRNA RP5-833A20.1 represses reverse cholesterol transport though the miR-382-5p/NFIA pathway. (F) lincRNA-p21 interacts with MDM2 and plays a protective role in atherosclerosis by enhancing p53 pathway activity in VSMC and macrophages. (G) SENCR promotes EC angiogenesis and represses VSMC migration through undefined mechanisms. (H) Stimulated by IL1α and PDGF, SMILR promotes atherosclerosis by enhancing VSMC proliferation through HAS2. (I) H19 promotes atherosclerosis by regulating p65 and p38 pathways in ECs and VSMCs. (J) lnc-Ang362 is stimulated by angiotensin II to regulate hypertension through the enhancement of miR-221 and miR-222 expression in VSMCs. (K) ANRIL enhances diabetic permeability, likely through the NF-κB/VEGF pathway. (L) MIAT promotes diabetes-induced microvascular dysfunction by serving as a miR-150-5p sponge and upregulating VEGF. (M) H19 promotes tumor angiogenesis by functioning as a microRNA sponge in miR-630/EZH2 and miR-29a/vasohibin2 pathways. (N) HULC promotes tumor angiogenesis and invasion by functioning as a miR-107 sponge and subsequently boosting the E2F1/SPK1 pathway. (O) TUG1 promotes tumor angiogenesis by enhancing VEGF expression through the inhibition of miR-34a-5p and miR-299. VSMC phenotypic switch from a contractile state to a proliferative state is a significant contributor to vascular hyperplasia and neointima formation in atherosclerosis. The function of several lncRNAs has been studied in VSMCs, which may have implications for atherosclerosis and other vascular diseases. LincRNA-p21 was drastically downregulated in atherosclerotic plaques of ApoE-/- mice and coronary artery tissues from CAD patients , while inhibition of lincRNA-p21 resulted in neointimal hyperplasia in vivo in a carotid artery injury model. Conversely, overexpression of lincRNA-p21 promoted apoptosis and repressed cell proliferation in VSMCs and macrophages. Overall, these results suggest a protective role for lincRNA-p21 in neointima formation during atherogenesis. Mechanistically, lincRNA-p21 associates with E3 ubiquitin ligase MDM2, and releases MDM2 repression of p53, therefore enabling p53-mediated transcriptional activity (Figure 4F). HIF1α -AS1 was initially identified in VSMCs, and its expression is dependent on BRG1 in VSMCs . Silencing of HIF1α -AS1 has been shown to promote cell proliferation and reduce cell death in VSMCs [95-97] . SENCR is a lncRNA enriched in ECs and VSMCs . SENCR silencing enhanced VSMC migration, while its overexpression reversed high glucose-induced VSMC proliferation and migration, suggesting a potentially protective role for SENCR in VSMCs (Figure 4G) [81, 105]. Of note, a positive function in angiogenesis has been assigned to SENCR ; however, the overall function of SENCR in atherosclerosis has not been established. Interleukin-1α (IL1α) and platelet-derived growth factor (PDGF) can induce proliferative and inflammatory pathways in VSMCs. The expression and secretion of lncRNA smooth muscle-induced lncRNA enhances replication (SMILR), was increased by IL1α and PDGF in VSMCs. It is upregulated in unstable atherosclerotic plaques in humans, and correlates with inflammatory C-Reactive Protein levels in human plasma. SMILR silencing markedly reduced, while its overexpression enhanced, VSMC proliferation. SMILR may have implications in vascular pathologies related to inflammation and VSMC proliferation. Together, these studies suggest a protective role for lincRNA-p21 and SENCR, but a contributive role for SMILR in VSMC phenotypic switch in atherogenesis. Changes in lncRNA expression have been observed in atherosclerosis animal models and human patients. In a rat atherosclerosis model, 1886 genes including 339 lncRNAs were altered in the left carotid artery in rats subjected to high fat diet and carotid artery balloon injury . Among them, GAS5, SNHG6 and Zfas1, were also upregulated in the carotid artery tissues of atherosclerosis patients. In the aorta of the ApoE-/- mice treated with high-fat diet, 354 lncRNAs were differentially expressed . Bioinformatic analyses suggested that Hnf4a, Ppara, Vdr, and Runx3 likely regulate the production of these lncRNAs. As stated above, several individual lncRNAs, including SMILR and RNCR3, are upregulated in human atherosclerotic lesions, and play contributive or protective roles in atherogenesis [98, 108]. Atherosclerotic plaque build-up in the coronary arteries can result in coronary artery disease (CAD). 86 lncRNAs have been shown to be differentially expressed in the plasma of CAD patients . Three of them, named OTTHUMT00000387022 (or CoroMarker), BAT5, and IL21R-AS1, were confirmed to be upregulated in both plasma and the peripheral blood mononuclear cells (PMBC) of CAD patients. CoroMarker was further confirmed as a CAD marker independent of known CAD risk factors or other cardiovascular diseases in a large cohort of patients. Several other lncRNAs have been shown to be associated with CAD. Genome-wide association studies have identified a susceptibility locus of coronary artery disease (CAD) on human chromosome (Chr) 9p21 [110-112]. The expression of antisense noncoding RNA in the INK4 locus (ANRIL) within the blood and atherosclerotic plaque tissue is associated with atherosclerosis risk at chromosome 9p21 [113, 114]. LincRNA-p21 expression was downregulated in patients with coronary artery disease . LncRNA H19 is a conserved lncRNA transcribed from the H19/IGF2 gene . Polymorphisms in H19 have been associated with CAD risk factors in a Chinese population , and H19 expression is upregulated in the serum of atherosclerosis patients and in the atherosclerotic plaques from ApoE-/- mice . Overexpression of H19 led to an increase of p38 and p65, key factors of MAPK and NF-kB signaling pathways respectively, and promoted cell proliferation and decreased apoptosis in HUVECs and VSMCs (Figure 4I). These data suggest lncRNA H19 might contribute to atherosclerosis and its associated CAD. Atherosclerosis and hypertension can lead to blocked ateries, or leaking or bursting of blood vessels, which results in ischemic or hemorrhagic stroke. Genome-wide RNA-sequencing experiments have revealed hundreds of novel stroke-responsive lncRNAs in the mouse cortex in a transient focal ischemia stroke model . The lncRNAs involved in schemic stroke have been detailed by outstanding recent reviews [119, 120]. Due to page limitation, we only highlight several of them in this review. MALAT1 is induced by oxygen-glucose deprivation (OGD) in cultured mouse brain microvascular endothelial cells (BMECs), as well as in isolated cerebral microvessels in mice after middle cerebral artery occlusion (MCAO) [44, 121]. LNA GapmeR silencing of MALAT1 increases OGD-induced BMEC cell death. The expression of pro-apoptotic factor Bim and pro-inflammatory cytokines MCP-1, IL-6, and E-selectin were shown to be upregulated after MALTA1 silencing in vitro and in vivo. Consistently, MALAT1-deficient mice show larger brain infarct size, worsened neurological scores, and reduced sensorimotor functions compared to wildtype control mice in the MCAO model, highlighting a protective role of MALTA1 in ischemic stroke . H19 levels are significantly increased in the circulation of stroke patients [122, 123]. H19 knockdown attenuates brain tissue loss and neurological deficits in vivo, and inhibits OGD-induced M1 microglial polarization and histone deacetylase 1 (HDAC1); HDAC1 overexpression could rescue the phenotypes associated with H19 knockdown . LncRNA SNHG14 activates microglia by regulating the miR-145-5p/PLA2G4A axis in cerebral infarction . In a rat MCAO model, lncRNA taurine-upregulated gene 1 (TUG1) functioned as a miR-9 sponge and subsequently upregulated BCL2L11 . Another lncRNA, CAMK2D-associated transcript 1 (C2dat1), regulates CaMKIIδ expression and protects neuronal cell death through NF-κB signaling in cerebral ischemia . Given these findings, these lncRNAs may have therapeutic implications inischemic stroke. Hypertension can be causative or secondary to other vascular diseases. The renin-angiotensin system is crucial for regulating the body's blood pressure. Angiotension II (ang II) can promote vasoconstriction, inflammation, fibrosis, and cell growth, representing a vital component of the system. Therefore, Ang II dys-regulation can lead to hypertension and atherosclerosis. Not surprisingly, Ang II has been shown to regulate 466 lncRNAs in VSMCs . One of them is lnc-Ang362, which co-transcribes with miR-221 and miR-222. Silencing of lnc-Ang362 reduced miR-221 and miR-222 expression, and repressed VSMC proliferation (Figure 4J). In other studies, 86 lncRNAs were upregulated and 276 were downregulated in a rat hypoxic pulmonary hypertension model , while 185 lncRNAs, including NR_036693, NR_027783, NR_033766 and NR_001284, were differentially expressed in endothelial tissues from the pulmonary arteries of chronic thromboembolic pulmonary hypertension patients . 68 lncRNAs were upregulated and 167 were downregulated in the aorta of spontaneously hypertensive rats . Among them, lncRNA XR007793 was increased by cyclic stress, and its knockdown attenuated VSMC proliferation and migration. Therefore, this lncRNA likely participates in vascular remodeling in hypertension. Preeclampsia is a major cause of fetal and maternal mortality characterized by hypertension. Several lncRNAs, including H19, MEG3, SPRY4-IT1, HOTAIR, MALAT1, and FLT1P1 and CEACAMP8, have shown potential roles in the pathogenesis of preeclampsia . Several other lncRNAs have shown implications in hypertension. MANTIS, a lncRNA known to facilitate angiogenesis, was downregulated in patients with idiopathic pulmonary arterial hypertension (IPAH) . LncRNA AK094457 was shown to enhance iNOS and nitric oxide (NO) expression in vascular ECs, suggesting a potential role in regulating blood pressure . In an independent study, LncRNA NONHSAT073641 is upregulated in lung tissues from subjects with chronic thromboembolic pulmonary hypertension (CTEPH) and pulmonary veno-occlusive disease (PVOD) . This lncRNA is highly homologous to the protein-coding gene, platelet-activating factor acetyl hybrdolase (PAFAH1B1). Both of them can promote angiogenesis but through different mechanisms. LncRNA LISPR1, named after a long intergenic noncoding RNA antisense to S1PR1, was found to be required for Sphingosine-1-Phosphate (S1P) signaling and endothelial function . Knockdown of LISPR1 attenuated endothelial S1P downstream signaling, including migration and spheroidal EC outgrowth, via downregulation of S1P receptor1 (S1PR1). Depletion of LISPR1 has been shown to facilitate binding of the transcriptional repressor ZNF354C to the S1PR1 promoter and reduce recruitment of RNA Polymerase II to the S1PR1 5'end . Interestingly, LISPR1 levels were found to be decreased in the human pulmonary disease Chronic Obstructive Pulmonary Disease (COPD). However, even with these recent studies, the role of lncRNAs in hypertensive vascular diseases is still largely unclear. Pathological angiogenesis in the eye is the most common cause of blindness at all ages and underlies several vascular retinopathies, including retinopathy of prematurity (ROP) in children, diabetic retinopathy (DR) in young adults and age-related macular degeneration (AMD) in the elderly. Recent studies are starting to reveal the role of lncRNAs in vascular retinopathies. About 50,000 prematurely born babies are blinded by ROP each year worldwide . The oxygen-induced retinopathy mouse model is an excellent representation for ROP and proliferative diabetic retinopathy . 326 and 51 lncRNAs were demonstrated to be dysregulated more than 2-fold in the vaso-obliteration and neovascularization phases of this model, respectively . Among them, Vax2os1 and Vax2os2, which are located in the opposite strand of the Vax2 homeobox transcription factor gene, were dynamically regulated in the model. These genes are also significantly altered in the aqueous humor of patients with neovascular AMD, implicating a role for these lncRNAs in the regulation of ocular neovascularization. Diabetes is a major cause of blindness, renal failure, lower limb amputation, and is a major risk factor for cardiovascular disease and stroke. Vascular lesions that develop over time are closely associated with the morbidity and mortality caused by diabetes . In the developed countries, 4.1 million US adults have DR, with 22% of them having vision-threatening retinopathy . Vascular dysfunction is an important feature of diabetic retinopathy, including blood-retinal barrier breakdown, capillary basement membrane thickening, pericytes loss and microvascular degeneration. Growing evidence indicates that lncRNAs are involved in vascular dysfunction in diabetes. The expression of lncRNA ANRIL is upregulated by high glucose, and responsible for the upregulation of VEGF under this condition . Similarly, ANRIL is upregulated in the retina of streptozotocin (STZ)-induced diabetic mice. ANRIL silencing in vitro leads to the repression of glucose-induced EC networking. In Anril-/- mice, diabetes-induced retinal VEGF upregulation was blunted, which is consistent with rescued vascular permeability. These studies demonstrate a critical role for ANRIL in regulating VEGF expression in diabetic retinopathies (Figure 4K). LncRNA MIAT is expressed in the nucleus of several retinal cells. It is upregulated by high glucose, and in the retina of diabetic rats and the fibrovascular membrane of diabetic patients . Knockdown of MIAT decreased EC proliferation and increased EC death under high glucose, and repressed EC migration and primitive vascular network formation induced by TNF-α or VEGF. MIAT knockdown in vivo ameliorated visual function, pericytes loss and vascular degeneration, and retinal inflammation in a STZ-induced diabetes rat model. As detailed earlier, MIAT acts as a ceRNA to sponge miR-150-5p, and relieve its repressive effect on VEGF expression (Figure 4L). MALAT1 is upregulated in the retina of STZ-induced diabetic rats and db/db diabetic mice . Intraocular injection of adenovirus expressing MALAT1 shRNA in diabetic rats ameliorated retinal function, including improved retinal electrical response of the retina, reduced retinal cell apoptosis, pericytes loss, capillary degeneration, and retinal inflammation. These suggest that MALAT1 silencing may have therapeutic implications in diabetes-related microvascular complications. MEG3 is downregulated by high glucose or oxidative stress in retinal ECs, as well as in the retina of STZ diabetic mice . MEG3 knockdown aggravated retinal microvascular dysfunction, as shown by increased capillary degeneration, microvascular leakage and inflammation. These results suggest that MEG3 downregulation may contribute to vascular dysfunction in diabetic retinopathy. Together, the current published data point to a protective function of MEG3, but a causative role for ANRIL, MIAT and MALAT1 in diabetic retinopathy. Angiogenesis plays a crucial role in tumor development and metastasis. To obtain a blood supply for tumor survival and growth, tumor cells usually secrete angiogenic factors, including VEGF and FGFs, to drive angiogenesis. Hypoxic tumor environments can drive tumor metabolism, angiogenesis, invasion and metastasis. A number of lncRNAs have been shown to be regulated by hypoxia in tumor cells, including NEAT1, H19, HOTAIR, MALAT1, and UCA1 . These lncRNAs contribute to the hallmarks of tumors. Here we focus on several lncRNAs that have established roles in tumor angiogenesis. For systematic review of lncRNAs in tumor angiogenesis, please refer to . H19 is a conserved imprinted lncRNA that functions as a trans-regulator of the imprinted gene network . It was shown to encode miR-675, and act as a molecular sponge for let-7 miRNAs to control muscle differentiation [144, 145]. It is significantly upregulated in glioblastoma tissue and associated with poor survival rates . It is also upregulated in microvessels from glioma tissues and glioma-associated endothelial cells cultured in glioma conditioned medium . Overexpression of H19 promoted glioblastoma cell invasion and angiogenesis in vitro, as well as tumorigenicity in vivo, while H19 silencing suppressed glioma-induced EC proliferation, migration and EC network formation [146, 147]. In bladder cancer, H19 promotes tumor metastasis by indirectly associating with EZH2 and inhibiting E-cadherin expression (Figure 4M) . Exosomes from cancer stem-cell-like (CSC) cells contain high quantities of H19, and either CSC exosome or H19 overexpression promotes EC network formation . H19 is thought to enhance tumor angiogenesis by functioning as a sponge for miR-29a and de-repress the miR-29a target gene and angiogenic factor vasohibin 2 . These studies suggest H19 could regulate tumor angiogenesis and metastasis through multiple mechanisms. Highly up-regulated in liver cancer (HULC), an oncogenic lncRNA, is upregulated in hepatocellular carcinoma (HCC) [150, 151]. HULC expression correlates with sphingosine kinase 1 (SPK1), VEGF and EC-specific Molecule 1 (ESM1) in tumor tissues [152, 153]. Overexpression of HULC promoted tumor angiogenesis, which was blocked by SPK1 silencing. HULC silencing suppressed angiogenesis by inhibiting tumor cell proliferation and invasion, and the effects could be reversed by ESM-1 overexpression. HULC promotes tumor angiogenesis in vitro and in vivo through several mechanisms. By functioning as a sponge for miR-107, HULC acts as a ceRNA to alleviate miR-107-mediated repression of the E2F1 transcription factor (Figure 4N). In turn, E2F1 can activate SPK1 transcription. HULC also increases ESM-1 expression through the PI3k/Akt/mTOR signaling pathway. Initially identified as a lncRNA associated with microvascular invasion in hepatocellular carcinoma (MVIH), MVIH is located within the intron of the ribosomal protein S24 (RPS24) and overlaps with part of the 3' end of the RPS24 transcript. MVIH is upregulated in HCCs, and its overexpression is associated with tumor growth and metastasis, as well as decreased recurrence-free survival in HCC, lung and breast cancers [154-156]. Lentivirus overexpression of MVIH promoted tumor growth and intrahepatic metastasis by activating angiogenesis in mouse models. A RNA-pulldown assay identified phosphoglycerate kinase 1 (PGK1) as an interacting protein for MVIH. MVIH overexpression inhibited PGK1 secretion. PGK1secreted by tumor cells has been shown to inhibit angiogenesis, thus having a negative impact on tumor growth and metastasis . Taurine upregulated 1 (TUG1) has been demonstrated to be an oncogenic or tumor suppressor lncRNA by different studies [158, 159]. It is upregulated by hypoxia and in human hepatoblastoma that are characterized by unusual hypervascularity . Knockdown of TUG1 remarkably suppressed tumor-induced EC proliferation, migration, networking and spheroid angiogenesis in vitro, as well as tumorigenesis and tumor-induced angiogenesis in mouse hepatoblastoma or glioblastoma xenograft models [160, 161]. Further studies showed that TUG1 functions as a ceRNA to mitigate the function of miR-34a-5p and miR-299 in repressing VEGFA expression (Figure 4O) [160-162]. Besides the above-mentioned lncRNAs, there is evidence supporting the involvement of other lncRNAs in tumor angiogenesis. LincRNA-p21 is downregulated in tumor tissues, but lincRNA-p21 levels in tumor cells correlates with microvascular density in patients, and time to relapse and cancer-specific survival . Silencing of lincRNA-p21 in cancer cells resulted in reduced expression of angiogenesis-related genes including VEGFA. Furthermore, the supernatant from these cells induced less EC tube formation in Matrigel, suggesting an overall proangiogenic function of lincRNA-p21 in tumors. LncRNA X-inactive-specific transcript (XIST) is upregulated in glioblastoma patients and glioma stem cells . XIST knockdown has a tumor-suppressor function, and leads to inhibited glioma angiogenesis, but increased blood-tumor barrier permeability [164, 165]. Mechanistically, XIST functions as a ceRNA for miR-137 and competes with miR-137 binding to its target genes ZO-2 and FOXC1. LncRNA olfactory receptor, family 3, subfamily A, member 4 (OR3A4) is upregulated in gastric cancer cells and is associated with cancer invasion and metastasis. OR3A4 overexpression promotes cancer cell growth, metastasis and tumor-induced angiogenesis by activating PDLIM2, MACC1, NTN4, and GNB2L1 expression . LncRNA small nucleolar RNA host gene 12 (SNHG12) promotes cancer cell growth, tumorigenesis and metastasis by serving as a sponge for miR-199a/b-5p [167-170]. 159 lncRNAs have been associated with neuroblastoma progression, and a knockdown study showed that HOXD-AS1, a lncRNA encoded in the HOXD cluster, regulates the expression of angiogenesis- and inflammation-related genes . Loss of MEG3 expression was observed in many primary human tumors and tumor cell lines. MEG3 has anti-proliferative and pro-apoptotic activities, and has tumor suppressor function, partly through stimulating P53 accumulation [61, 62]. PTENP1 lncRNA is a pseudogene of the tumor suppressor gene PTEN. Both PTENP1 and PTEN expression is downregulated in several HCC cells . PTENP1 overexpression elevated PTEN levels by acting as a sponge for the oncomirs miR-17, miR-19b and miR-20a, which would otherwise target PTEN. As result, this mitigates hepatocellular carcinoma growth and tumor angiogenesis in vivo. GAS5 lncRNA has been identified as a tumor suppressor by controlling cell apoptosis, proliferation, metastasis, DNA repair and tumor cell metabolism . Emerging studies have identified Angio-LncRs as important regulators of angiogenesis. 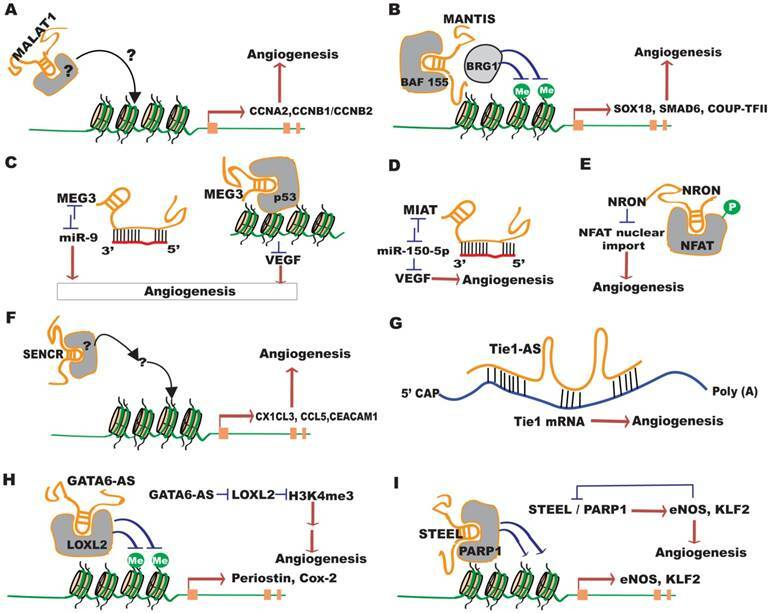 In particular, MALAT1, MANTIS, MEG3, PUNISHER, Tie-1-AS, GATA6-AS and STEEL have been established as important regulators of angiogenesis in vivo. Moreover, lncRNAs have been shown to be dynamically regulated in an array of vascular diseases, including atherosclerosis, tumorigenesis, and diabetic vascular complications. These studies have confirmed the involvement of lncRNAs in vascular biology, and have opened venues to further study the function and mechanism of lncRNAs in angiogenesis and vascular diseases. It would be expected that more Angio-LncRs, including vascular cell-type specific or species-specific lncRNAs, will be discovered and studied in the near future. Some of the lncRNAs may be established as vascular disease markers or therapeutic targets. As with other lncRNAs, Angio-LncRs show diverse functional mechanisms in cells, including but not limited to: regulating promoter and enhancer activities of angiogenesis-related genes in cis, modulating gene expression in trans by interacting with DNA/RNA-binding proteins or chromatin modifying proteins, functioning as antisense RNAs to mRNAs or miRNAs sponges, or encoding a micropeptide. Even more intriguing, any given lncRNA may possess multiple mechanisitic functions. Therefore, all of these possible roles pose exciting challenges to decipher the function and mechanism of lncRNAs in angiogenesis . Utililizing or developing new and cutting-edge technologies, such as CRISPR-mediated gene editing , genome-wide chromatin interrogation, locked nucleic acids (LNA)  or bridged nucleic acids (BNA) technologies , will be required to elucidate the function of Angio-LncRs in angiogenesis, as well as to test their therapeutic value. Excitingly, GapmeR targeting MALAT1 has recently been shown to trigger anti-multiple myeloma activities, highlighting the therapeutic potential of targeting lncRNAs . 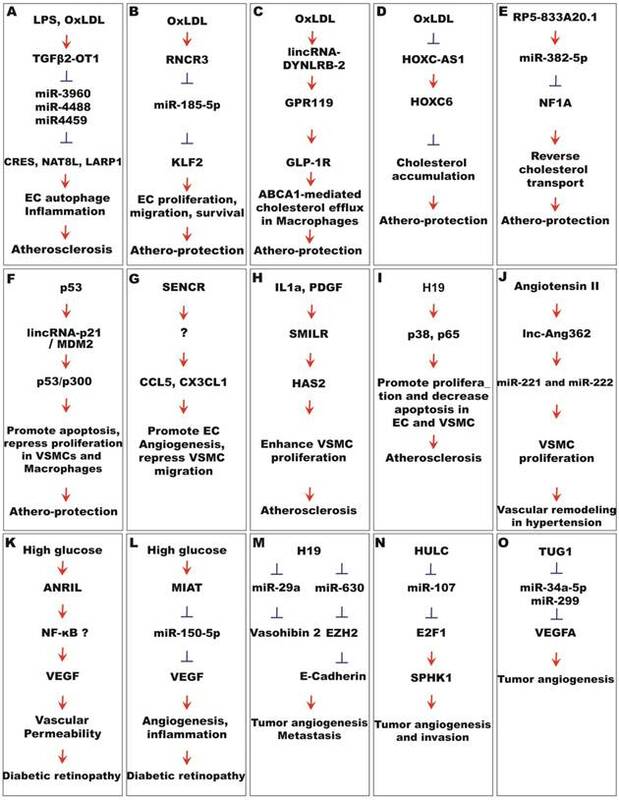 Clinical trials targeting various lncRNAs are ongoing for vascular and other diseases [178-180]. AMD: age-related macular degeneration; ang II: angiotensin II; ANRIL: antisense noncoding RNA in the INK4 locus; ATAC-Seq: assay for transposase accessibility with subsequent DNA sequencing; BACE1-AS: anti-sense lncRNA to beta-secretase-1; BRG1: brahma related gene-1; BMEC: brahma related gene-1; BNA: bridged nucleic acids; CAD: coronary artery disease; C2dat1: CAMK2D-associated transcript 1; CSC: cancer stem cell; CSS: cancer-specific survival; CERS1: ceramide synthase 1; COPD: chronic obstructive pulmonary disease; CTEPH: chronic thromboembolic pulmonary hypertension; ceRNAs: competing endogenous RNAs; CLI: critical limb ischemia; CREB: cyclic AMP response element (CRE)-binding protein; Cox-2: cyclooxygenase-2; DR: diabetic retinopathy; ESM1: EC-specific molecule 1; ESC: embryonic stem cell; EC: endothelial cell; eNOS: endothelial nitric oxide synthase; EHT: engineered heart tissue; FAIRE: formaldehyde assisted isolation of regulatory elements; FMR: fragile X mental retardation; FLI1: friend leukemia virus integration 1; GATA6-AS: long non-coding antisense transcript of GATA6; GEC: glioma-associated endothelial cells; H3K4me3: trimethylated lysine 4 of histone H3; HNRPK: heterogeneous nuclear ribonucleoprotein K; HULC: highly up-regulated in liver cancer; HDAC1: histone deacetylase 1; HOTTIP: HOTAIR and HOXA distal transcript antisense RNA; HOXC-AS1: lncRNA HOXC cluster antisense RNA 1; IPAH: idiopathic pulmonary arterial hypertension; JARID1B: jumonji/ARID domain-containing protein 1B; KLF2: Kruppel-like factor 2; LARP1: la ribonucleoprotein domain family, member 1; LNA: locked nucleic acid; lncRNAs: long noncoding RNAs; LOXL2: lysyl oxidase-like 2; MALAT1: metastasis‐associated lung adenocarcinoma transcript 1; MCAO: middle cerebral artery occlusion; MEG3: maternally expressed 3; MVIH: microvascular invasion in hepatocellular carcinoma; MIAT: myocardial infarction (MI)-associated transcript; NAT8L: N-acetyltransferase 8-like; NO: nitric oxide; NRON: noncoding repressor of NFAT; NFAT: nuclear factor of activated T-cells; ox-LDL: oxidized low-density lipoprotein; OGD: oxygen and glucose depravation; PA: palmitic acid; PGK1: phosphoglycerate kinase 1; PDGF: platelet derived growth factor; PARP1: poly [ADP ribosylase] polymerase 1; PRC2: polycomb repressive complex 2; PAFAH1B1: platelet-activating factor acetyl hybrdolase; PVOD: pulmonary veno-occlusive disease; RNCR3: retinal non-coding RNA3; ROP: retinopathy of prematurity; RPS24: ribosomal protein S24; RBPs: RNA-binding proteins; S1PR1: S1P receptor1; SENCR: smooth muscle and endothelial cell-enriched migration/differentiation-associated long noncoding RNA; SMILR: smooth muscle-induced lncRNA enhances replication; SNHG12: small nucleolar RNA host gene 12; STEEL: spliced-transcript endothelial-enriched lncRNA; STZ: streptozotocin; TUG1: Taurine upregulated 1; TTR: terms of time to relapse; KLF2: transcription factor Kruppel-like factor 2; TSS: transcriptional start sites; TGFβ2-OT1: transforming growth factor beta 2 overlapping transcript 1; T-UCstem1: a lncRNA containing transcribed ultraconserved elements (T-UCEs), regulates embryonic stem cells; Tie-1AS: tyrosine kinase containing immunoglobulin and epidermal growth factor homology domain-1(Tie-1) antisense lncRNA; VEGF: vascular endothelial growth factor; VSMCs: vascular smooth muscle cells; XIST: lncRNA X-inactive-specific transcript. Due to page limitations, many valuable papers have been left out in the manuscript. We thank Dr. Stryder Meadows from Tulane University for his careful proofreading of the manuscript. S.W. was supported by startup funds from Tulane University, NIH Grants EY021862 and EY026069, a career development award from the Research to Prevent Blindness foundation, and a Bright Focus Foundation Award in Age-related Macular Degeneration.